I must admit, this was a pretty tasty burger, but, it just wasn’t the same. I honestly think there is something about having someone else make something for you that makes it taste that much better. But, I know you all are wondering, what is in there, so here is how you can recreate this Works Burger. * This recipe works great with any meat of choice: vegan burger, veggie burger, chicken or turkey burger, beef or bison….take your pick. I used almost all organic ingredients because I think they taste better and are better for you, but, the choice is yours. Cook on the grill as you normally would ~ about 3-5 minutes per side. 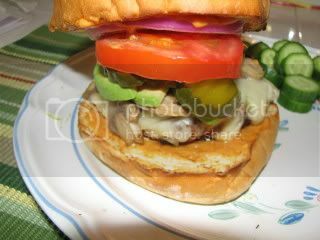 Top burgers with Lite Cheddar Cheese (I used TJ’s)/(use soy cheese to make it vegan) and grill for another minute. While the cheese is melting, you can add the buns to the grill to toast them. Tadah! That’s it….it looks like alot more typing, but, I put this all together in about 30 minutes before The Husband had to run to a meeting. The Gillwood’s Bun was seriously the perfect addition aside from being way too big for my veggie burger. It has a sweeter taste like Hawaiian bread. I sooooo wanted to eat all of this, but, after cutting it in half and eating my cucumber slices, I was full. The Husband gladly took my other half. I tested out my new All Clad Stainless Steel Stiry Fry Pan from Food Buzz tonight to make my lunch for tomorrow. Be sure to check back then for the full report. Have a great night all ~ I am off to read my new finds at Barnes and Nobles today – yeah! « I just may never be able to eat a "regular" cupcake again! It looks delicious. But I agree–how come it always tastes better when someone else makes it for you? 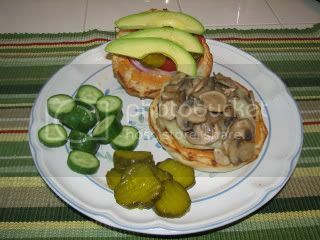 Your veggie burger looks great! I agree..there’s just something about having someone else prepare food that makes it taste even better! Thanks Kirwin & Emily. It was really, really good, but, I think not cooking it would have made it perfect 🙂 lol.